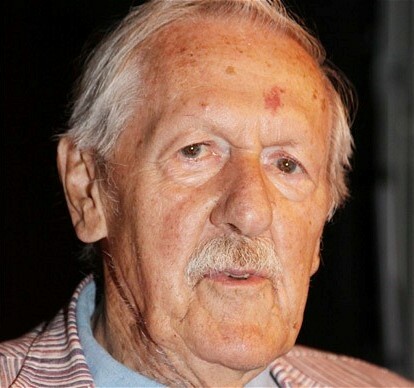 Brian Aldiss, who marked the start of his career with a nomination for the Best New Writer Hugo (1959), gained a place in the SF Hall of Fame (2004), and received honors from the Queen (2005), died in his sleep August 19, the day after his 92nd birthday. Everything in life was a source of material for Aldiss. He served in the British army in WWII in Burma, experience that later backgrounded his “Horatio Stubbs” series of non-sf novels. After demobilization in 1947, he was hired as a bookshop assistant in Oxford, and wrote humorous fictional sketches about his work for The Bookseller, a trade magazine. That material, rounded into a novel, became his first book, The Brightfount Diaries (1955). By then Aldiss had also started to write sf. The SF Encyclopedia lists his first published sf story as “Criminal Record” in Science Fantasy (July 1954), and other stories appeared in 1954-1955. In the war I received a badly mimeographed flier for a fan group. I must have written for it. It carried a photo of the group. My father seized it at the breakfast table, shouted ‘They’re all perverts!’ and flung the brochure on the fire. So I had no acquaintance with fandom until they got in touch with me in 1956, after I had won the Observer prize for a short story set in the year 2500 AD. My contact then was Helen Winnick, who worked in London in Hanging Sword Passage. We went down to the White Horse, where I met Sam Youd and John Brunner…. The 1957 Worldcon in London was his first convention. The prolific and popular author rapidly became an important figure in sf. He served as President of the British Science Fiction Association (BSFA) from 1960-1964, an office that was an honorary figurehead, and ceremonial in purpose. He gained international acclaim when the five novelettes of his “Hothouse” series collectively won the 1962 Best Short Fiction Hugo. 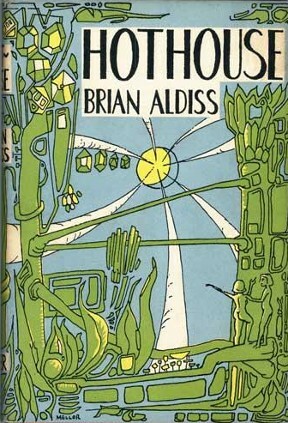 His “Hothouse” series would be novelized as The Long Afternoon of Earth (1962), and together with his first sf novel, Non-Stop (1958), and Greybeard (1964), ranks among his best sf. Also highly regarded is the Helliconia trilogy: Helliconia Spring (1982), Summer (1983) and Winter (1985). Helliconia Spring won the John W. Campbell Memorial Award. Spring and Winter also received Nebula nominations. All three books won the British SF Association’s Best Novel award. Aldiss wrote a great deal of important nonfiction about sf, too, such as the memorable Billion Year Spree (1973), which, when revised as the Trillion Year Spree (1986) in collaboration with David Wingrove, won the Best Nonfiction Book Hugo. He received many career awards. He was named a SFWA Grand Master (2000), was a Living Inductee to the Science Fiction Hall of Fame (2004), recognized with the Science Fiction Research Association’s Pilgrim Award (1978), and with the Prix Utopia (1999) for life achievement from the French Utopiales International Festival. He was elected a fellow of the Royal Literary Society in 1989. I was greatly chuffed by the award “for services to Literature” — a euphemism in this case for SF…. But when chatting to Her Majesty, I was disappointed to find she had only got as far as John Wyndham and the triffids. “What do you like about it?” I asked. She replied, “Oh, it’s such a cosy catastrophe.” I blushed. While many prolific authors with long careers have been frustrated to see their work go out of print, Aldiss was rescued from that fate by former HarperCollins imprint, The Friday Project, which published more than 50 of Aldiss’ backlist works in 2013. SF and SF fandom ranked highly in Brian’s life: he liked to say that fandom was the unusual kingdom in which the serfs threw feasts for the kings rather than the other way around. However family came first which came as a surprise to the 2001 Eurocon organisers that originally had us both down as guests (mine was lowly fan GoH) but I e-mailed him to enquire whether we might travel together: safety in numbers and all that when travelling overseas. But Brian had to decline as his family was throwing him a special get-together at that time. Rest assured, though family came first, SF fandom as a priority came not long after. At a US gathering he showed an invitation he had from Buckingham Palace for a reception wit the Queen but that clashed with the US convention: the SF convention easily took priority, no contest. And at the Loncon 3 (2014) closing ceremonies, which fell on his birthday, August 18, he was serenaded with a rousing rendition of “Happy Birthday” by the entire audience. For many who journeyed to the con it was also a kind of farewell. 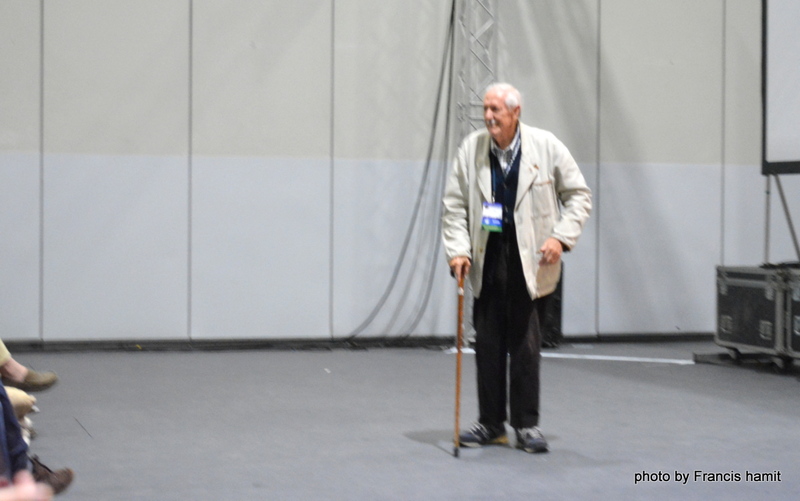 Brian Aldiss being serenaded with “Happy Birthday” at LonCon 3 in 2014. Aldiss’ first marriage was to Olive Fortescue (1948-1965, ending in divorce), and his second was to Margaret Manson, who predeceased him in 1997. He is survived by his partner, Alison Soskice, and four children: Clive and Wendy from his first marriage, and Timothy and Charlotte from his second. This appreciation has focused more on Aldiss’ connection with fandom. Here are links to several insightful appreciations about his writing and literary impact. By R. A. MacAvoy: I had thought to begin this trip report with the idea it was something lost in the mail. Lost for many, many years. That seemed clever at first, but I realized that my memories aren’t close to clear enough for me to get away with that. Not even with people who know how muddled my memories can be. So, instead, this is a trip report to a con that didn’t get written in 1987, but is being written now, in 2016. In a way, that makes it easier. I don’t really have to explain getting things muddled. I can simply be glad I remember anything. In early 1987 I was between books, and as always in that situation, I felt desperate to do something fannish to keep my hand in until the next idea came my way. And I was reading that the World Con, which was going to be held in Brighton, was having the usual difficulties getting funds together, so I reasoned I could solve their problems and mine with one very long journey, from the West Coast of California to the South Coast of England and back. This was not really financially responsible, of course. My income was, at the time dedicated toward building onto our excuse for a house, whilst Ron’s income kept us living in it day to day. But still, I could take it off my taxes. Business expenses, or some such. I went alone, because Ron could not get time off to travel with me. It seems, then and now, the software industry doesn’t allow for holidays except at the most peculiar times, such as when we went to the arctic circle in mid-winter. But that happened many years later. To Brighton World Con I went alone. And going that way isn’t particularly fannish. At the time, it seemed to me that fans travelled in close packs, crept into hotel rooms unnoticed and slept on the floor, hoping not to be noticed. This might explain why SF conventions, even large ones, were not particularly desired events at hotels around the world. That, plus the fact that SF fans have an abysmally low bar bill compared with most any other sort of convention, and hotels do depend upon the bar bill when hosting conventions. So. I arrived alone at Brighton and was put into a room at the Radisson Hotel, which was far above my pay-grade, but also far away from the convention center. I remember I thought about all the unused space in my room, and wondered if I ought to sneak some more fans of some sort into the hotel. But I literally didn’t know anybody, and also, I wasn’t confident I could pull it off. I walked down the road between the Radisson and the convention center, and across the way was the water and the famed Brighton Pier. At the time it was a mess. There were signs warning of danger and unsafe surfaces. The Channel itself reminded me very much of Lake Eerie, where I grew up. As long as one can’t see the other side, any body of water seems to be an ocean. The lines for registration were very long and registration is more than usually dreary when one shows up alone. When I finally got to registration there was a great deal of ka-tah over which sort of badge I should have. I was certainly no sort of guest, but I wasn’t to be considered a proper sort of fan, either, as I had, at the time, published six or seven books in the field. So I was shuffled around until I had some sort of badge with my name on it and something that described me as a writer, but as nothing special. And that is the perfect description of what I was and what I intended to be at the con. Nothing special. No panels. No responsibilities. Free. What does a lonely fan do at a convention, when presented with the leaflet describing the coming programming? I know what I did. I looked immediately for the dealer’s room and the art show. And the masquerade, of course. Panels were the last thing on my mind. The dealers’ rooms were huge, and the art show was glorious. I can say today I’ve never seen the like of the art show at Conspiracy ’87. I remember especially one man who created art out of skulls he found as roadkill. These were mostly skulls of raptors, including owls, although I believe I saw a few fox skulls as well. In the eye sockets of the cleaned skulls he inserted gems, beveled in silver or gold. Sometimes, he also placed jewels in the foreheads. They were stunning, and the price was astronomical. To me, at least, astronomical. I did set my eye on some of the plaster reproductions of such skulls, which were indistinguishable from the real thing, in my eye. There was one of an owl’s skull . . . I wondered if I had the chutzpah to wear a jeweled owl’s skull around my neck, once back at the ranch. But more about that later. The first convention assemblage was a large open forum. A sort of welcome to the convention, I suppose, with numerous speakers from the Brighton Fan Community. They were all young men and all seemed to have the same message. It was an angry message. They said that Americans, (and they made no clear distinction between Yanks and Canadians, so I suppose we were all in that boat together,) had hijacked this British convention. They were extremely irate. I was flabbergasted, because the message I had received from my friends who worked at Locus and at The Other Change of Hobbit back in California, had been that we must rescue the convention, which was in danger of bankruptcy. Since then I’ve learned that every convention is in danger of bankruptcy. That is a convention’s normal state of existence. But as I’d come so very many miles with the idea I was helping, I have to say my feelings were hurt. The other repeated message told us from the podium of that one huge assembly was that Americans did not write proper SF, but instead stories of ‘Red Indians in Outer Space’. That, like the owl’s skull, will be important to this story later. Luckily, I don’t remember a single name of the angry young men who spoke from the podium that day. I don’t think any of them were writers. Those names I would have remembered. I watched the audience carefully from my position standing near an exit door. (That is my preferred position at all convention events.) The people I could tell were American, mostly by their shoes, for at the time Americans wore a sort of brightly-colored trainer than was uncommon footwear to other people, seemed to shrink into their seats. And I watched for the rest of the convention as the Americans went about their business, getting into and out of lifts, and dodging people in hallways, muttering the word ‘sorry’ almost as a mantra. I have never seen a less confident lot of hijackers in my life. I must repeat here that the angry young men of Brighton did not represent anything of Britain, or of England, but themselves. Because the cost of meals at the convention hall was so steep, I began to make a practice of darting out of the building to get my meals at near-by shops, where the locals were so warm and friendly, and so careful to guide a visitor into not buying more food than she could likely afford, that any idea I might have had of extending the distinct feeling of unwelcome beyond the doors of the convention center died aborning. I also visited a florist and bought daisies, first to have someone to talk to and later to have silly things to give away. As it turned out, it was not only the Americans who felt rejected by the welcoming speeches. There were Dutch, Swedish, Australian and Italian fans at the convention also. We met at the bars and in lobby corners and had a fine convention of our own. And it was there that I met my own Jugoslav translators, who had come with the specific idea of meeting me. (I never knew I had Jugoslav translators.) It was flattering and embarrassing to meet them, especially after I stood them up at a meeting we had scheduled the first day, which flew out of my head completely with the overwhelm of the con. So I spent the next few days chasing them down hallways, constantly apologizing, and trying to explain that yes, I was that naturally disorganized and that I did appreciate them. I really did. Finally we all made up. In years to come, when there was no longer a Jugoslavia, I used to wonder what had become of the two of them. They were sparkling with enthusiasm and energy. I know I gave them daisies. 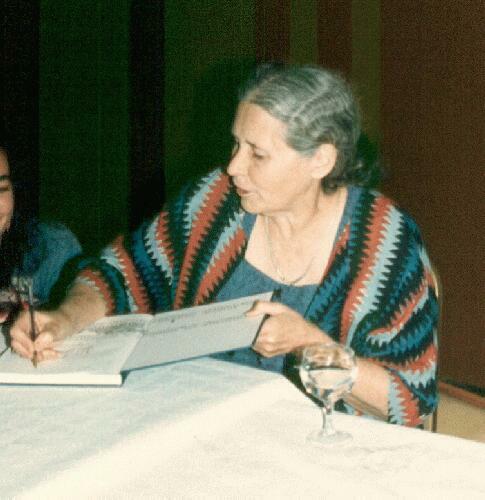 Doris Lessing signs at 1987 Worldcon. Photo by Frank Olynyk. During the convention I missed the opportunity to meet two people I would have liked to meet. The first was Doris Lessing. I stood within three meters of her and said to myself go on. Step forward. She can only look through you and give a blank smile. She can’t hurt you. But I couldn’t. 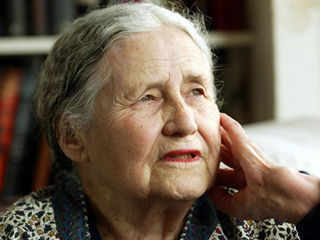 I was so very intimidated at the idea of being in the same room with Doris Lessing that I couldn’t move. In the end, it doesn’t matter. I have often been in the same room with her work. The other person I didn’t meet was Dave Langford, who was one of the fan GOHs. If I could have known the future I would have sought him out and said Langford, one day in the future we will be friends, and so I’d like to shake your hand now. But of course, I didn’t know and I didn’t shake his hand. These days, I post or comment to him almost daily, and I suppose time travel is completely unnecessary to the process. The second morning of the convention I had a most peculiar experience. Even for convention fandom, it was most peculiar. I was under the awning of the convention center, waiting for the doors to open. (I am incurably early for everything. That is, when I haven’t forgotten to show up at all.) I put my backpack and convention bag down and sat with my back against one of the awning posts, waiting for the doors to open. A minute or so later another fan appeared. A young man. Very young. He stood there and looked down at me. His eyes narrowed and he asked me where I had gotten that badge. I had no idea how to answer him. Should I show him my passport? My driver’s license? But then, why should I show this boy anything? I pointed to the name. R.A. MacAvoy. “That’s me,” I said. I looked at his badge, but I have no memory of what his name was. There were so many layers of misunderstanding in this I didn’t know how to address it. It did know to slide up the steel post I’d been leaning against, so I’d be on my feet. I told him my name was Roberta A. MacAvoy. I hate to say that to people, because the name ‘Roberta’ has always fit me as well as roller skates fit a pig. But it was the clearest explanation I could give. It occurred to me that the boy had conflated me with Robert A. Heinlein somehow. Perhaps he was young enough not to know the difference. But his mental processes had ceased to matter at this moment, as he was approaching me square-shouldered and full of belligerence. My mind raced. I was I a foreign country and I did not know what my rights of self-defense were. I was imagining ending up in jail for hurting this idiot. I was also imagining my refusing to defend myself and ending up in hospital. At that moment the big glass doors burst open and two men in convention center security uniforms came to stand between us – between me and the angry boy. One security man quietly asked me what was going on. I replied to him that I had no idea what was going on, but that I was profoundly glad to see him. The other security man tried to touch the young fan and was repeatedly brushed away. A few seconds later I was in the convention hall. It was almost time to open, after all, and I was very grateful. The security man even carried my backpack and swag bag into the hall with him. I might well have forgotten them and left them in the street. To this day I have no idea why my identity was questioned by the young fan so strenuously. It’s a mystery. Thank ghod it didn’t become a bloody mystery. That’s about what I remember from Conspiracy ’87. The panels were like panels everywhere. The running up and down the streets of Brighton was not my usual convention experience, as it took place outdoors. The masquerade was astonishing. I bought the replica owl’s skull, with silver and garnets. Between earthquakes and moving house, somehow I no longer have it. But, if you remember, I began this by saying I had gone to Brighton between story ideas. I came home with a good one. At least I think it’s good. I wrote a novel about red Indians in outer space. Because the First Nation people are no more red than any other group of humans, I had my protagonist genetically altered to be really red. And I added in descendants of the people of the subcontinent of India, just to complicate things. It is the only real Space Opera I have ever written. So I got my money’s worth out of the anger of the young men of Brighton. In fact, the advance of that book paid for the roof of our house. (1) LE GUIN DOCUMENTARY FUNDED. Arwen Curry e-mailed word to supporters of the Worlds of Ursula K. Le Guin documentary Kickstarter that they reached $200,000 in pledges today. Now that we have raised our entire budget, our NEH grant will be released. That means we’ll be able to stop fundraising and start production right away…. That also means everyone will get Ursula’s list of What to Read in 2016! I can’t wait to see what’s on there. With 48 hours left in the campaign, pledges are still trickling in. Rest assured, we’ll use every dime toward making the film more worthy of its subject. As we move forward over these next months, I’ll keep you posted on our progress. (2) THE EAR DOCTOR. Big Finish will bring back David Tennant and Catherine Tate as the Tenth Doctor and his companion Donna Nobel in three forthcoming audio dramas reports Radio Times. More details in “Everything we know about the new David Tennant and Catherine Tate Doctor Who Adventures”. And there’s an audio excerpt at “Keep calm – but we’ve got the exclusive first clip of David Tennant and Catherine Tate’s return to Doctor Who”. According to the Big Finish website, the stories will see the Tenth Doctor and Donna Noble travel to a spaceport, discover a deadly weapon called the Time Reaver and find deadly iPads at the London Technology museum. In other words, some classic action from for the returning characters. (3) INGENIOUS FELAPTON. Camestros Felapton asks: Can you identify the titles of these 2015 novels from a combination of emojis? (Repeated here for the benefit of anyone who didn’t see it in last night’s comments.) Note — there may be a problem with this transcription — it shows up okay in the draft, but the preview is all question marks. We’ll see…. A new sci-fi novel launched on a truly fitting mission last month, as documented in a new video: Rob Boffard’s “Zero-G” cruised to the upper stratosphere for a very unusual author reading at the edge of space. The book ascended via weather balloon on Jan. 18 from the town of Ross on Wye in southern England. Once the rig got high up in the sky, an audio recording of Boffard reading the prologue and the first chapter began to play loudly. Boffard’s crew documented the process in an extended video, as well as through tweets as it all happened. (5) ROWLING’S SECRET PAN PLAN. Emily Asher-Perrin makes her case for believing “Dumbledore’s Origin Story is the Predecessor to Peter Pan” at Tor.com. …wanna go down a weird rabbit hole with me? …and there on the window ledge sat perched, like a giant bird, a young man with golden hair. In the split second that the lantern’s light illuminated him, Harry saw the delight upon his handsome face, then the intruder shot a Stunning Spell from his wand and jumped neatly backward out of the window with a crow of laughter. (6) GROSS INCOME. “Ask the Tax Czarina: Bartering ” at the SFWA Blog tries to dispel magical thinking about a common source of noncash income. To sum up, here are some real world examples. My client provides editing and mentoring services for writers. I prepare and sign her tax return, which includes her writing business. I will have bartered tax return preparation income and a deduction for her editing services. My client has bartered editing income and a deduction for her tax return being prepared. While tax return preparation usually goes on Schedule A as an itemized deduction, it may be deducted directly against a business, if that’s the reason my client has her tax return prepared and signed by a paid preparer. The transaction offsets for both of us, it’s a wash. Assuming the amount is under $600, neither of us issues the other a Form 1099-MISC…. In summary, barter transactions are reportable. Transactions that wash are less of an issue than transactions that don’t. The above examples demonstrate that bartering might or might not result in net taxable income for either or both parties. Sometimes it’s clear how the transaction should be treated and sometimes it’s not. (7) SPACE TO THINK. Tor.com has 10 of Kyle Cassidy’s photos of sf authors’ writing spaces. The lens used to shoot Samuel Delany’s work area makes it look like the International Space Station. Most of the others look like the comfortable living rooms of affluent people – no shots of people with laptops on borrowed tables at Starbucks – with the exception of Joe Haldeman who is writing in the dark by the light of a lantern. March 2, 1933 — The movie King Kong premiered in New York. Born March 2, 1949 — Gates McFadden. Cheryl Gates McFadden is an American actress and choreographer. She is best known for playing Dr. Beverly Crusher in the Star Trek: The Next Generation television series and in the four subsequent films. Born March 2, 1904 — “Dr. Seuss,” Theodor Geisel. (11) A SERIES OF WORLDCONS REMEMBERED. Kevin Henney writes down his vivid impressions of Worldcons of decades gone by for asemantic. Two years later, again with Josh, I visited Worldcon ’86 in Atlanta. For a teenager from North London, even cocooned within the convention hotels, this visit to the American South was an eye-opener…. the view from the front seat revealed a shifting cultural landscape you didn’t see on TV. Sidewalks were invisibly colour coded, black one side, white the other. Worldcon’s name that year, ConFederation, also shows how far we’ve come — you’d have to be a sad puppy to think that name was appropriate now. I was there for the full five days. There were five of us saving money and shift-sleeping in a room for two, but I used that room for little more than storage and showering. I did the first three days on three hours sleep, giving myself the luxury of seven hours over the final two — a sleeping pattern I could get away with only as an adolescent (or, a few years later, as a new parent). Worldcon was big even back then. It was non-stop sessions, parties, caffeine, bumping into American gods like Frederick Pohl, faux phaser fights in hallways between Klingons and Starfleet (pick a side, go on pick a side…), talking to people you didn’t know, making friends that you did actually keep in touch with for a couple of years, even without cyberspace assistance of email and social media. This Worldcon was smaller and less grand than the one in Atlanta, with a 1980s British seaside-town twist. But it still dwarfed 1984 Eastercon. There were writers I’d seen at SeaCon and in Atlanta, there were guests of honour (including Jim Burns), there were up-and-coming writers (a certain Iain Banks, with and without the M, comes to mind), there was Hawkwind (Tom’s kind of thing, but thanks I’ll pass), there were parties (in the hotel and on the beach) and more. And then I took a break from cons and fandom. Quite a long break. A fairy-tale sleep whose spell was broken in part by Josh (yup, same one, after all these years) and BristolCon. And in good time for Loncon, Worldcon 2014…. (12) OF ALL THE NERVES. Soft tissues like this are rarely preserved — “Exquisitely detailed 520 million-year-old fossil shows individual nerves” in the Washington Post. Chengjiangocaris kunmingensis wasn’t exactly a beautiful animal: The crustacean-like Cambrian creature had a long, segmented body and an unholy number of legs that it used to scuttle across the ocean floor. But scientists are oohing and ahhing over the ugly arthropod anyway, and for good reason. The nervous system of one 520 million-year-old specimen shows some of the best and most well-preserved nerves ever seen in an animal of that era. According to a study published Monday in the Proceedings of the National Academy of Sciences, the fossil may be the oldest and most detailed example of a central nervous system yet identified, with even individual nerves — rarely preserved soft tissue — visible enough to study. (13) CORMAN SUES CITCO. A 1996 Worldcon GoH, “Roger Corman Lawsuit Blames Citco for Losing $60 Million of Family’s Money”. The famed filmmaker says he wasn’t told that his money was being managed by troubled hedge fund manager Buddy Fletcher. Roger Corman and his wife Julie Corman, together responsible for hundreds of films and the mentoring of some of Hollywood’s biggest directors and actors, have filed a lawsuit that says they put money in an investment fund managed by George Soros before the money was moved and they ended up losing up to $60 million. According to the complaint filed in Los Angeles Superior Court on Monday, the administrator of the Soros fund was the Citco Group. The Cormans’ primary contact there was Ermanno Unternaehrer. For the next six years, things seemed fine. In 2002, Unternaehrer is said to have recommended that a vehicle named “Pasig, Ltd” be set up in the British Virgin Islands for tax reasons. Corman says he initially was a director of the newly incorporated company, but a few months later, upon advice, Corman says he resigned, becoming only a signatory on the account. By 2008, the lawsuit says that there was $73 million under Citco’s “complete control” and management fell to Alphonse “Buddy” Fletcher. (14) NOT ON YOUR AM DIAL. “Repeating fast radio bursts recorded for the first time” at Science News. Fast radio bursts from deep space have never been seen to repeat — until now. Ten blasts of radio waves recorded last May and June all come from the same direction, researchers report online March 2 in Nature. So did a signal detected in 2012, say Laura Spitler, an astrophysicist at the Max Planck Institute for Radio Astronomy in Bonn, Germany, and colleagues. All 11 signals were detected at the Arecibo Observatory in Puerto Rico. Fast radio bursts, or FRBs, last a few milliseconds and, except for one, all appear to originate in other galaxies (SN: 8/9/14, p. 22). For the repeater, each of the signals encountered the same amount of intergalactic plasma, meaning they traveled the same distance. That shared feature makes an ironclad case for a common source, says Duncan Lorimer, an astrophysicist at West Virginia University in Morgantown and co-discoverer of the first FRB, reported in 2007. The question now is what fraction of sources repeat, he says. There may be multiple classes of FRBs, with some recurring and some not, each triggered by something different. (15) THE GUY WHO DIDN’T MAKE MILLIONS. 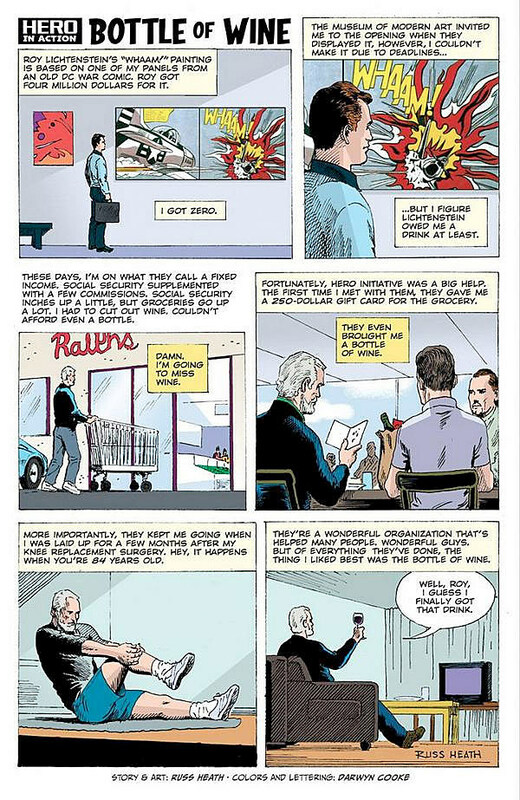 “Russ Heath’s Comic About Being Ripped Off By Roy Lichtenstein Will Give You A New Appreciation For The Hero Initiative” at Comics Alliance. If you’re not familiar with the Hero Initiative, they’re one of our favorite organizations here at ComicsAlliance — a nonprofit set up to create a “financial safety net” for comic book creators in need, helping with medical bills and living expenses. It’s one thing to know that they’re doing good things in the world, but Heath’s comic, showing both the help provided during his surgery and the simple pleasure of a bottle of wine, really shows just how much good they’re doing. J.K. Rowling just confirmed that Fantastic Beasts and Where to Find Them, the Harry Potter prequel currently in production with Warner Bros., won’t just be one movie. It will be THREE. (17) SPACE AGE LEFTOVERS. Abandoned In Place: Preserving America’s Space History by Roland Miller, published on March 1, collects images of the now-discarded facilities that helped America reach outer space. They have recently launched a new digital line of short works and novellas, Unsung Signals. Unsung Signals features mid-length fiction, stories too long for magazines or journals but too short for traditional book-length publication. We believe stories should be as long as they need to be. We’re giving the writers the freedom to write the way they want without the need to pad or trim unnecessarily, to give a home to work that would otherwise be left unpublished, or altered to fit a format. We will consider stories up to 3000 words (preferred length is under 2000 words though). We pay £25 per story. For this we get first electronic rights exclusive for three months, with non-exclusive archival rights. We’ll pay within 30 days of publication via PayPal. (19) FINDING DORY TRAILER. Disney-Pixar has dropped the first full Finding Dory trailer. Doris Lessing passed away at home November 17. She was 94. Winner of the Nobel Prize for Literature, she was also a past Worldcon guest of honor, at Brighton in 1987. Lessing authored more than 50 novels. Beginning with Briefing for a Descent into Hell (1971), she began to write what she called “inner-space fiction.” Then, in the novel series Canopus in Argos: Archives (vol. 1–5, 1979–1984) Lessing wrote about the post-atomic war development of the human species. The text of her Conspiracy GoH speech is available in Worldcon Guest of Honor Speeches, edited by Resnick and Siclari. She also wrote a sidebar for the 1987 Worldcon souvenir book about how watching a TV documentary about nudism led her to think about the original creation of clothing, culture – and science fiction stories. It closed with an example of one of these ur-stories. “Very well, says Heru, I’ll take you but what will you give me in exchange? “I’ll tell you a story as I sit on your back and we fly together, will that do? Ray Harryhausen, Ray Bradbury and Forry Ackerman at the Three Legends event in 2008. Visual effects genius Ray Harryhausen, who brought the fantastic alive using stop-motion animation, died May 7 in London at the age of 92. Between 1949 and 1981 he created effects for Mighty Joe Young, The Beast from 20,000 Fathoms (partly based on a short story, “The Fog Horn,” by Ray Bradbury), It Came from Beneath the Sea, The Animal World, 20 Million Miles to Earth, The 7th Voyage of Sinbad, The 3 Worlds of Gulliver, Mysterious Island, Jason and the Argonauts, First Men in the Moon, One Million Years B.C., The Valley of Gwangi, The Golden Voyage of Sinbad, Sinbad and the Eye of the Tiger and Clash of the Titans. Harryhausen’s fascination with special effects began in 1933 when he saw King Kong, the handiwork of pioneering animator Willis O’Brien. (They would eventually work together on Mighty Joe Young). 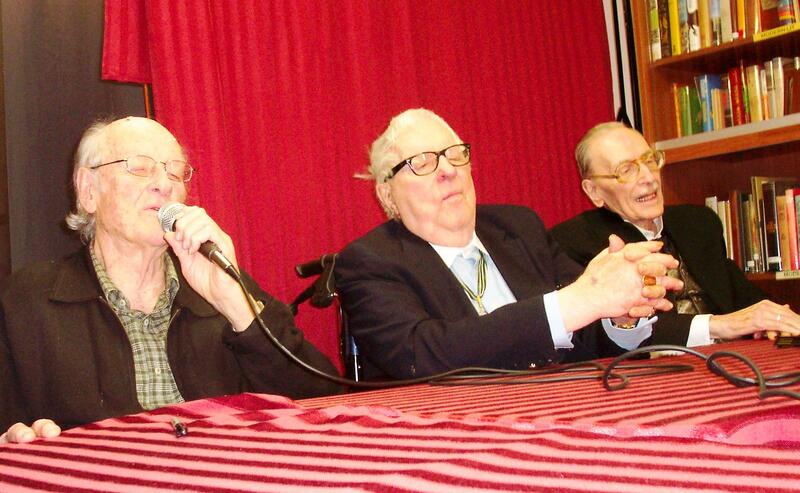 Harryhausen’s devotion to King Kong also led to his lifelong friendships with Forrest J Ackerman and Ray Bradbury. He went to a revival of the movie in the early 1940s and saw some stills on display he wanted to copy. The theater employee he asked was Roy Test Jr., co-founder of the Los Angeles Science Fantasy League, who knew the owner of the photos, Forry Ackerman and put them in touch. Six decades later, as part of the British Film Institute’s celebration of Harryhausen’s 90th birthday, Ray Bradbury described on video their first meeting at Ackerman’s house, when they talked about what they wanted to do with their lives, Harryhausen confessing that he wanted to make movies and Bradbury nervously admitting that he wanted to be a writer…. The heart of his technique was a process he developed called Dynamation. It involved photographing a miniature — of a dinosaur, say — against a rear-projection screen through a partly masked pane of glass. The masked portion would then be re-exposed to insert foreground elements from the live footage. The effect was to make the creature appear to move in the midst of live action. It could now be seen walking behind a live tree, or viewed in the middle distance over the shoulder of a live actor — effects difficult to achieve before. Each of the model skeletons was about eight to 10 inches high, and six of the seven were made for the sequence. The remaining one was a veteran from The Seventh Voyage of Sinbad, slightly repainted to match the new members of the family. When all the skeletons have manifested themselves to Jason and his men, they are commanded by Acetes to ‘Kill, kill, kill them all,’ and we hear an unearthly scream. What follows is a sequence of which I am very proud. I had three men fighting seven skeletons, and each skeleton had five appendages to move in each separate frame of film. This meant at least 35 animation movements, each synchronised to the actors’ movements. Some days I was producing less than one second of screen time; in the end the whole sequence took a record four and a half months. His innovations were honored in 1992 with a career Academy Award for technical achievement. At the Oscar ceremony, Tom Hanks told the audience that he thought the greatest movie of all time was not Citizen Kane or Casablanca but Jason and the Argonauts. Which is quite a reversal of fortunes when you consider that Harryhausen’s The 7th Voyage of Sinbad, a 1959 Hugo nominee, lost to No Award. Science fiction fandom did eventually become more appreciative. Harryhausen was a Worldcon Guest of Honor in 1987 at Brighton. And he was inducted into the Science Fiction Hall of Fame in 2005. His filmmaking colleagues also found ways to acknowledge him, dropping in references to his name in animated movies, such as Harryhausen’s restaurant in Monsters, Inc., and giving him live cameos in Beverly Hills Cop III (1994, Bar Patron) and Mighty Joe Young (1998, Gentleman at Party). The thing that finally persuaded me to quit was that I saw that the nature of the hero was changing. When I was growing up we had heroes such as Cary Grant, Ronald Colman and David Niven, real gentlemen on the screen. Now, all you have is Arnold Schwarzenegger, Sylvester Stallone and all those people who solve problems with their fists. It’s a different world and I sometimes feel I’m not part of it. Say what you like about Hollywood in my time, but they were in the business of happy endings, of escapism. Now, you have to sit through two hours of people dying, you know. Today, everything’s so graphic it’s rather unnerving. Russian sf writer Boris Strugatsky who, with his late brother Arkady, was a 1987 Worldcon GoH, died November 19 at the age of 79. He had recently experienced heart troubles and was in the hospital undergoing dialysis. This weekend Visioncon in Springfield, MO offers Artist GoH Alain Viesca, author GoH Shane Moore, Comic Guest of Honor Javier Saltares and a flock of other guests. Chief among them are horror writers Cullen Bunn, Wrath James White, Mike Oliveri, Brian Keene. The quartet is being trumpeted as the competition in an “Author’s Gross Out Contest” Saturday at 10 p.m. Cullen Bunn has won the World Horror Convention Gross-Out Contest four times, you know, so the bar is set pretty high. I think we had that contest at a Worldcon once, except we called it the Sunday session of the 1987 Business Meeting, held in a room that had just hosted an all-night beer tasting, and then the floor cleaned with an ammonia solution before the chairs were set. The smell of the place is forever branded in my memory.